Hilaire-Germain-Edgar Degas was born on July 19, 1834 in Paris. His father, Auguste, was a French banker, and his mother, Célestine, was an American from New Orleans. At the age of wighteen he received the honor of being allowed to copy at the Louvre (the same honor that Monet detested). While copying Velázquez's painting The Infanta Margarita directly onto a copper plate, Degas met one of his life-long friends and one of the founders of Impressionism, Édouard Manet. It wasn’t until 1868 that Degas finally began receiving recognition as an artist. 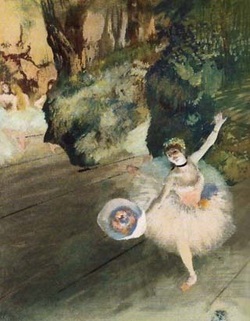 Degas is known for his many paintings of ballerinas. It is important to know the societal background in order to understand why the ballerinas were prominent figures in Degas’ work. In the 1850s women began to dominate the ballet scene (up until that time only men had been permitted to be ballerinas. Attending the ballet was “in fashion” during this time, and many middle-aged men known as subscribers were allowed to go backstage and watch the dancers practice. Many times this turned into the men asking for sexual favors from the young women, but the ballet was important and Degas covered it in detail. He did try to downplay the sexual connotation of the ballet, but more often than not middle-aged men can be seen in the background watching the women. From 1868 onwards, Degas took part in many exhibitions and art shows with many of his impressionist contemporaries. These exhibitions were intended to promote the art form, as well as create a place where artists could sell their artwork, work with contemporaries and get their art published in an art journal. 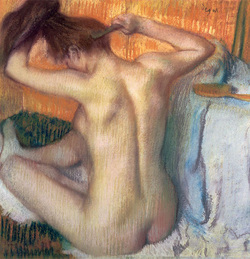 Degas was known as the most important promoter of the impressionist movement. He was a major believer in creating a place where his colleagues could gather together, discuss their art form and truly advance the art world. He did all this through his many exhibitions, and he was also started the first impressionist exhibition. The most important thing to remember about Degas was that he was an outspoken promoter of the movement. He was the one who drew attention to the movement.